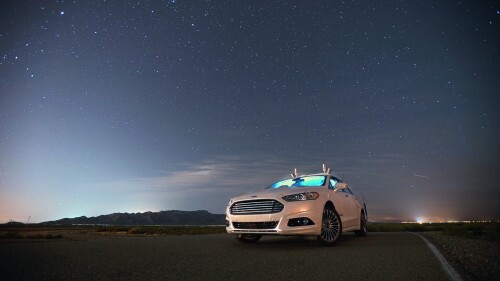 Ford’s Autonomous Fusion Hybrid driving in the dark in Arizona. Image courtesy of Ford. Ford has taken what it calls its next step toward bringing self-driving cars to market, with a test in total darkness on Arizona desert roads, Angela Moscaritolo wrote for PC. In testing at Ford Arizona Proving Ground, the Ford Fusion Hybrid autonomous research vehicle, which had no headlights, steered “flawlessly” around winding roads,” according to Ford. An autonomous vehicle ideally should have three types of sensors: radar, cameras, and LiDAR. LiDAR, which stands for Light Detection and Ranging, can determine the shape, motion, and material of objects in the environment. It’s what enabled the test vehicle to drive itself in the dark. Ford says its LiDAR sensors can shoot out 2.8 million laser pulses per second. The technology, which is used for airborne mapping and other applications, works by transmitting laser signals over all light ranges (ultraviolet, visible, infrared). It amplifies light that is scattered back through an optical telescope and photomultiplier tube. Thanks to LiDAR, the test cars aren’t reliant on the sun shining, nor cameras detecting painted white lines on the asphalt. The ability of autonomous vehicles to drive in the dark will likely reduce the number of car accidents once such vehicles are on the market. The National Highway Traffic Safety Administration has found that the traffic fatality rate is three times higher in the dark than in daylight. Randal Visintainer, director of Autonomous Vehicles at Ford, said it’s important that self-driving vehicles have backup systems, like airplanes, so if one technology fails, there are others that can take over. But, he said, even more important is to create techology that can take the place of “the backup human.” Ford is working on that. Ford’s plan is to triple the size of its test vehicle fleet to 30. They will be tested in California, at Ford’s Palo Alto outpost; in Arizona; and in Michigan, at Mcity, a “faux” city for vehicle testing near Ann Arbor. Driving a car around in the pitch dark would be perilous in real life, of course: Headlights are as much about being seen as they are about seeing the road in front of you. Having a chance to see the technology in action is quite magical, and to me, the key innovation is that the car is taking a step into the realm of augmented reality. Well, to the degree that a robot has a concept of a non-augmented reality, that is.